Puerto Rican nationals, Esteban Acevedo Tapia, 28, Ruben Nunez, 49, and Joel Hernandez, 28, were each given a sentence of six months imprisonment after previously pleading guilty to the offence. They had also pleaded not guilty to the charge of failing to declare monies, a charge which was subsequently dropped by the Crown following their guilty plea to the illegal entry offence. The court was told that ranks of the Royal Virgin Islands Police Force (RVIPF) were making enquiries when they reportedly heard a commotion and entered an apartment where the men were allegedly staying in Cane Garden Bay. One of the men reportedly jumped out of the window of the room after becoming aware of the presence of the Police in the area. A large pillow case stuffed with cash was reportedly found at the place where the men were staying. The men allegedly denied knowledge of the money at the time, claiming that they did not know what it was or whom it had belonged to. Checks were later made with immigration authorities regarding the status of the three men and it was discovered that the men had entered the Territory illegally. Hernandez allegedly told Police that he came as a favour to someone and expected to be paid a sum of $5000 upon delivery of a package that he had no knowledge about and the men received explicit instructions not to tamper with it. The men were allegedly given a phone with two (2) contacts while they were at the apartment and Mr Nunez was reportedly the one responsible for ensuring that the alleged package arrived at its required destination. Mr Tapia reportedly told Police that he suspected the package contained money or something illegal and also later told Police he did not know how the money had gotten in the pillow. Mr Nunez allegedly paid $500 to come by boat after reportedly missing a ferry to the island and told Police he had run away from the apartment because of his illegal status. It was related that Nunez (construction worker), Tapia (fisherman) and Hernandez (waiter) had no prior convictions and also that the men were not found with any illegal substance or in the Territory for any illegal reasons. The Crown declined to give sentencing guidelines. The court disagreed that the men’s agreement to forfeit the monies they were found with counted as a mitigating factor and it was related that the issue was wholly outside the men’s control. 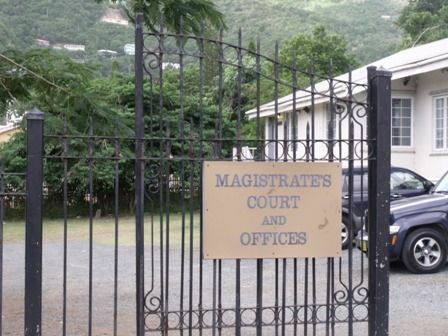 Senior Magistrate Tamia Richards said the court looked at the prevalence of the offence and stated that there were sixteen similar offences committed since 2009 while adding that the men came to the Territory for profit having been promised payment for their services. They reportedly received no payments to date. Magistrate Richards was especially concerned that there was a high degree of planning wherein the men came on two private vessels and a hotel room was pre-arranged for them to spend the time here. “They did not come by happenstance,” Magistrate Richards said. She also expressed concern that the men planned to come to the Virgin Islands to bring an unknown package to the Territory and wanted to send the strongest message possible to not only punish the persons who had committed the illegal act but also to deter others from committing the same. The men were then handed their sentences and told that it would run from their first date of remand. Principal Crown Counsel Tiffany Scatliffe told the court today, January 30, 2013 that the Office of the Director of Public Prosecutions (DPP) issued a notice of discontinuance with regard to a charge of failing to declare a sum of money against a Puerto Rican trio. The men, Esteban Acevedo Tapia, Ruben Nunez and Joel Hernandez, were arrested by officers of the Special Investigations Unit of the Royal Virgin Islands Police Force(RVIPF) in December, 2012 for Customs and Immigration offences. They had previously pleaded not guilty to the charge dropped by the Crown. Ms Scatliffe told the court that the notice was filed on January 30, 2013. “With regard to the notice issued on January 28, 2013, we intend to make a forfeiture order in writing,” Ms Scatliffe related to the court. The prosecutor further told the court that the men had denied any knowledge of the monies seized by the Royal Virgin Islands Police Force and it was also indicated that the men would not challenge the Crown’s stated intention to file the application of forfeiture for the monies seized. The matter was stood down and is expected to be resumed sometime today, January 30, 2013. ROAD TOWN, Tortola, VI – The Office of the Director of Public Prosecutions (DPP) has now confirmed that the Crown will be proceeding with charges against three Puerto Rican nationals who recently pleaded guilty to the charge of landing in the Territory without being granted leave from an Immigration Officer. The men, Esteban Acevedo Tapia, Ruben Nunez and Joel Hernandez, were arrested by officers of the Special Investigations Unit of the Royal Virgin Islands Police Force (RVIPF) in December, 2012 for Customs and Immigration offences. The men were arrested during a joint Police, Customs and Immigration operation in December, 2012 at a guest house in the Cane Garden Bay area. Police reportedly searched the guest house occupied by the suspects and a quantity of cash was allegedly discovered. The accused denied failing to declare $133,110 to Her Majesty’s Customs as they each offered a plea of not guilty to the joint charge instituted by the Crown when they appeared before the Magistrate’s Court previously on January 15, 2012. Senior Crown Counsel Sarah Benjamin had requested an adjournment in the matter to January 21 in order for the Crown to establish a position with regard to the men pleading not guilty. The Crown proposed on January 21, 2012 to proceed with charges against the three men despite their plea of guilty to the charge of landing in the Territory without being granted leave from an Immigration Officer. The court was further told that the matter was still being investigated and that the RVIPF was in the process of gathering more information. The possibility of another charge being placed before the men was also mentioned. The men were remanded to prison until the matter comes before the court again on January 30, 2013. "failing to declare $133,110 "....that sound like a waste of court time to you. Keep the cash, send them back! How many rich people fail to declare even more cash when they visit the BVI! This is all cause they are mulattos! it have people who do worst things in this place and they are not treated like this. $133,000...and they did not know it...Bullsh*t. They knew what they were here for and what it was for. People, people,people...!! Aways talking sh#$%%!!! What they do not know is that people from govermment, do worst thing and steal money from us and who say something????? Nobody!!!! Because we think they cant do that!! Yeahhh right!! It is easy talks when you are not on the problem. So shut your mouth and dont talk.